Wireless networking has been around since 1997, becoming increasingly efficient with each release. But is Wi-Fi really the answer to cable-free networking going forward? New wireless technologies are in development, each with the potential to disrupt the Wi-Fi status quo. The future could see the use of very different routers, with data sent and received without an obtrusive device hanging on a wall. 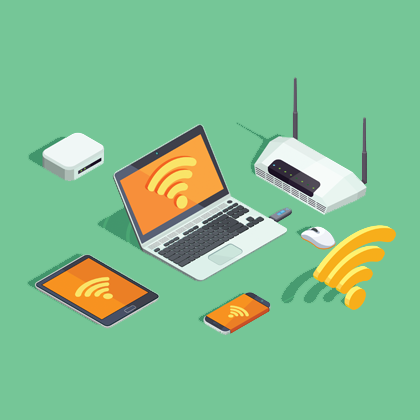 Wi-Fi 6 is the latest iteration of wireless networking, and also goes by the name of IEEE 802.11ax. It is successor to IEEE 802.11ac and features robust security, high speeds, and low power requirements. This makes Wi-Fi 6 ideal for Internet of Things applications. With a Wi-Fi 6 compatible network, speeds of up to 12Gbps can be enjoyed (usually 10Gbps), with increased support for multiple device connections, and more efficient data throughput. This is an advantage for 4K, VR, and AR video applications. Wi-Fi 6 is expected to be launched in 2019. Whereas Wi-Fi transmits data using radio waves, Li-Fi uses light. This gives Li-Fi several advantages, such as being able to work in areas of electromagnetic interference (such as hospitals), and faster speeds. There is also the possibility of greater bandwidth, especially compared to older versions of Wi-Fi. Li-Fi can currently be transmitted using LED lamps over the visible spectrum, as well as ultraviolet and infrared. It comes with its own unique strengths and weaknesses. For example, Li-Fi cannot transmit data through walls, so each room needs its own router. This means that access to a Li-Fi network can be more carefully managed. While it might prove useful in offices and labs, Li-Fi could be a particular advantage to Industrial Ethernet applications. There may be a use for Li-Fi on the road, too, allowing smart vehicles to communicate with each other, perhaps to manage speeds in the event of an incident ahead. Bluetooth is a useful wireless technology, albeit one restricted in range and bandwidth. This could be made obsolete by a new wireless tech, Passive Wi-Fi. With data transmitted with 10,000 times less power than Wi-Fi and 1,000 times less than Bluetooth LE, Passive Wi-Fi was developed by a team from the University of Washington. Passive Wi-Fi uses a technique similar to RFID cards to communicate, with smoke detectors, temperature sensors and security cameras cited as likely applications for Passive Wi-Fi in future. It seems likely that certain IoT applications may benefit from Passive Wi-Fi rather than 5G or Wi-Fi 6 connectivity. With a low 11Mpbs speed, however, it is unlikely to contribute to office, design collaboration, or industrial applications. While wireless charging seems limited to a few general release smartphones and various industrial portable devices, it continues to offer possibilities for the future. Limited by its short range, wireless charging could become far more common with the introduction of data transmission. Currently, wireless chargers usually communicate wirelessly with the charging device, merely to monitor power levels. A team from North Carolina State University has developed a system allowing short-range charging and data transmission, which could have considerable implications once developed further. While Wi-Fi 6 is likely to dominate wireless networking for the foreseeable future, these alternative technologies seem strong candidates to replace (in the case of Li-Fi) or merge in the years to come. Christian Cawley is a freelance technology writer, with a background in healthcare and financial services industries. He writes extensively online, and contributes to print periodicals and specials.